UltraNova, Analog Modeling Synth from Novation in the Nova series. UltraNova is an analogue-modelling synthesizer designed "for everyone: from first-time synth purchasers to keyboard addicts." 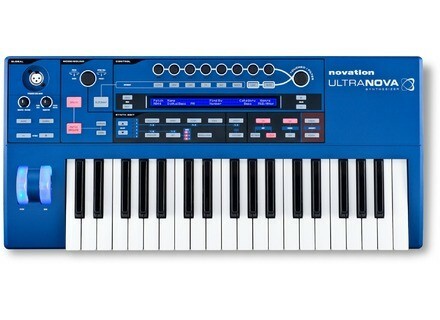 Carrying the Nova name, UltraNova is the next generation of Novation's iconic synth family, which brought you the SuperNova and SuperNova II. It has a 37-note Fatar keybed, illuminated pitch and modulation wheels, eight assignable touch-sensitive rotary encoders, a 144-character LCD, and a large knob for fine control of parameters. Under the hood, UltraNova's arpeggiator, vocoder and USB audio interface make it useful for today's music makers, and bus powering lets you put it at the centre of your stage or studio rig. New, single-part synth engine with up to 18 voices, 14 filter types, 36 wavetables and five effect slots. Eight assignable touch-sensitive rotary controllers, with one large knob to instantly give you fine control of any parameter. Touch and Tweak controls enable totally new sound-shaping and performance options: Trigger envelopes, LFOs, filters and effects just by touching the encoders. A tried and tested, stage-ready 37-note keybed with aftertouch, bus power from USB, a 12-band vocoder (with included dynamic gooseneck mic), and loads of controls makes UltraNova the perfect stage or studio synth. Free software plug-in editor gives you full visual editing control. The included Patch Librarian lets you organise, store and share unlimited patches. Built-in two-in, four-out USB audio interface. Stream high-quality audio to and from a host computer and control your monitor mix, all from UltraNova. Full connectivity for stage and studio. Balanced line-level and stereo S/PDIF outputs, plus MIDI In, Out and Thru ports. Moog Music MiniMoog Voyager XL Official Designed in celebration of the 40th anniversary of the Minimoog, the Minimoog Voyager XL is described as "a sonic powerhouse that pays homage to important milestones in the Moog synthesizer legacy." Korg Electribe-MX & Electribe-SX SD Korg is now shipping the tube-driven Elecrtribe-MX (EMX1SD) and Elecrtribe-SX SD (ESX1SD), the newest models in the updated Electribe series. Moog Music MiniMoog Voyager XL It looks like Moog is set to announce the Voyager XL, a new 61-key monosynth.